Beachfront balcony. Spacious layout. Oceanfront. Completely furnished. Master bedroom. View from bed Dine by the sea. Beachfront pool. Pool palapa. Lost Beach Bahia Encantada. Bahia Encantada. Elegant community. Rooftop terrace. Romantic getaway. Jaco Beach. Completely renovated in 2017! This beautifully updated two bedroom, two bath Bahia Encantada 3L Oceanfront Junior Penthouse comes fully furnished with everything you and your guests need to enjoy that luxurious and carefree tropical vacation you've been dreaming of! 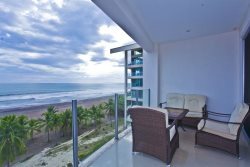 With access to balconies off of each bedroom in this unit, you and your guests won't need to go far to experience the stunning beauty of the ocean and beach that surround this unit. The spectacular rooftop terrace offers unparalleled ocean views and unforgettable sunset experiences. The open-concept living area features comfortable seating, a flat screen TV, and easy access to the kitchen on one side and the large, private dining balcony on the other. Whether you're cooking for your family or entertaining guests, the kitchen is fully equipped to meet your needs, with full-size stainless steel appliances, granite countertops and a large breakfast bar. Other kitchen appliances include a fridge, freezer, dishwasher, oven, toaster, blender, coffee maker and microwave. The master bedroom features a comfy king-sized bed, in-suite bathroom, flat screen TV and sliding door access to the dining balcony. The guest bedroom is located just down the hall from a full guest bathroom and features a queen-size bed and sliding door access to a guest balcony. Premium linens, plush pillows and a full-size washer and dryer unit top off the long list of amenities included with this unit. If you want to experience an unforgettable vacation, full of luxury and comfort, this unit is the one for you!